WWII Airmen Lost in 1942 to be Honored and Memorialized This Memorial Day by Eternal Reefs and Underwater Historical Expeditions, Ltd.
Six WWI crewmen lost at sea during a training mission in 1942 will receive Military Honors similar to this on Memorial Day, marking the first time their are recognized for their service and sacrifice. Lt. Fred Dees, Jr., Co-Pilot from Burgaw, N.C.
Lt. Donald Vail, Pilot from Macomb, Ill. The ceremony will be held at 11 a.m. on Monday, May 30, 2016 at VFW Post 10097, 17770 Pine Ridge Road, Ft. Myers Beach, Fla. 33931. Eternal Reefs, Reef Innovations and the Reef Ball Foundation have partnered with Underwater Historical Explorations. 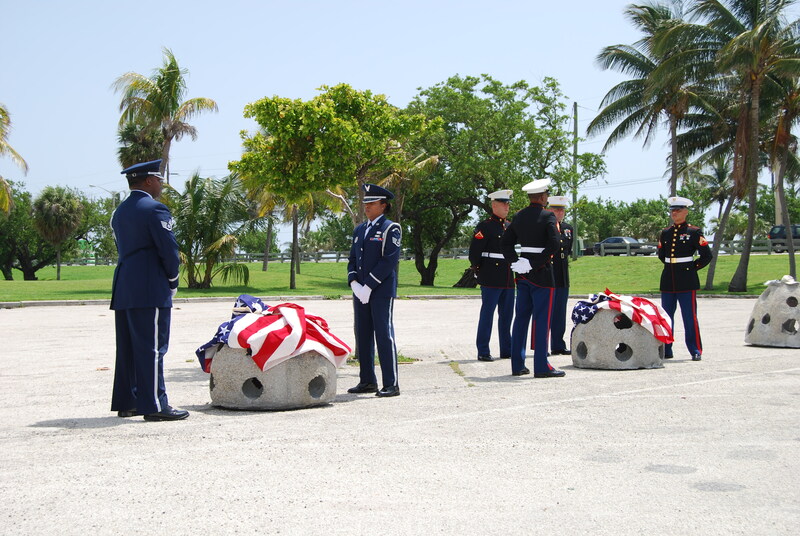 Ltd. (UHE) and VFW Post 10097 in Ft. Myers, Fla. to honor and memorialize these men. A UHE dive team discovered the crash site in 2008, more than 42 miles offshore Ft. Myers, Fla., researched the flight history, and notified remaining family members at that time. The six-man crew was aboard the first of eight B-26 planes from the 480th Bomb Squadron, 336th Bomb Group, lost in training accidents between Nov. 16, 1942 and Nov. 15, 1943. In all, 47 airmen died. Inscribed plaques will mark large memorials that will be placed on the ocean floor crash site at a later date by a UHE dive team. Seven memorials in total will be placed at that underwater crash site and noted as sacred ground in recognition of the sacrifice of the airmen. One memorial weighing approximately 1,300 pounds and standing 3’ high by 4’ wide will commemorate the entire crew. Six separate memorials, about 700 pounds each and 2’ by 3’, will honor the sacrifice of each individual man. For an image of the plaques, visit http://www.facebook.com/eternalreefs. Casey’s late mother, Abigail Kittiko Casey of White Oak, Pa., recalled memories of her brother William (Bill) Kittiko when the UHE notified the families of the discovered B-26 Marauder wreckage in 2008. "Bill was not one to have a big discussion about something," she told the Pittsburgh Post-Gazette in 2008. "He made up his mind to do something and he told you." Abigail, two years younger than Kittiko, was a high school senior when the plane disappeared and told the Post-Gazette she remembered the series of telegrams in late 1942 that impacted her family, first saying her brother was missing and another that they were still searching. About Underwater Historical Explorations, Ltd. The mission of Underwater Historical Explorations, a non-profit organization, is to promote and participate in the underwater research, search, investigation and salvage of underwater wreck sites of significant historical value. Our primary goal is to gather and retrieve information of historic value of each wreck and wreck site in a professional and lawful manner. The excavation and salvage of each site including the retrieval of artifacts and cargo will be accomplished consistent with our goals of advancing and confirming written history of these sites; also to seek out historically known but as of yet undiscovered wrecks. Learn more at http://www.uhexplorations.com. Read reports of the B-26 Marauder discovery at the UHE website as well as in news reports from The Pittsburgh Post-Gazette, the Santiva Chronicle, 12 News NBC-TV AZCentral.com, and the Ft. Myers News-Press. Eternal Reefs, Inc. is a Sarasota-based company that provides a creative, environmentally-enhancing way to memorialize the cremated remains of a loved one. The company incorporates cremated remains into a concrete mixture used to cast artificial reef formations. The artificial reefs are dedicated as permanent memorials while also bolstering natural coastal reef formations. Since 1998, the company has placed more than 1,500 Memorial Reefs in 25 locations off the coasts of New Jersey, Maryland, Virginia, North Carolina, South Carolina, Florida (North Atlantic, South Atlantic, Gulf Coast and Panhandle) and Texas, substantially increasing the ocean’s diminishing reef systems. Memorial reefs can only go in properly permitted locations by the U.S. Government. Reef Innovations and the Reef Ball Foundation are strategic partners with Eternal Reefs. Learn more at Eternal Reefs Inc. at http://www.EternalReefs.com. Military Honors like this one will be held this Memorial Day for six crewmen lost in 1942 when their B-26 Marauder went down in 1942 on a training mission. 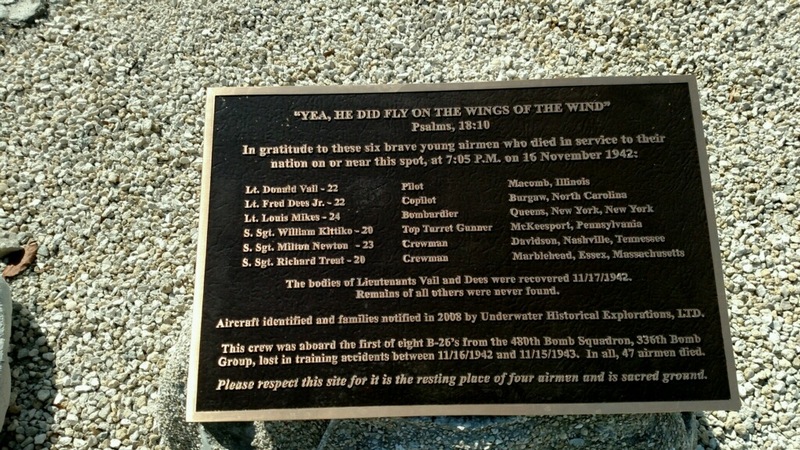 The plaque that will be on the memorial marking the underwater crash site of six WWII crewman lost in November 1942.